The first and foremost thing that needs to be treated in Hypothyroidism is fatigue. Maintaining a healthy thyroid stimulating (TSH) hormone level takes time and managing fatigue is all about making healthy lifestyle changes and getting enough sleep. Do not skip your medication. 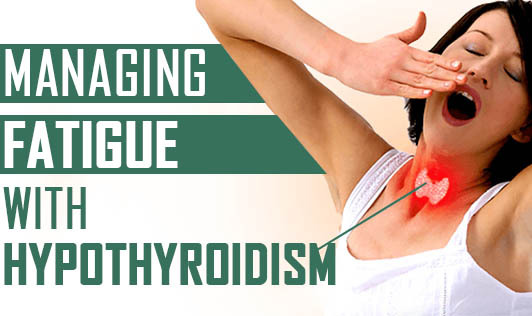 Thyroid medication helps most people and it is wise to follow your doctor's instructions if you need effective thyroid treatment. Eat a balanced diet rich in fresh fruits and vegetables, whole grains, and lean proteins which provide adequate amount of energy to help you stay active through the day. Avoid having a heavy meal at bedtime as it may interfere with sleep. Instead, opt for a light dinner with small and frequent, but healthy snacks during the day. A certain amount of physical activity in the day is absolutely essential as it helps you stay active and refreshed throughout the day. One can incorporate simple stretches, brisk walking, or running as a part of their daily routine which would in turn, help improve the energy levels and deal with fatigue more efficiently. Meditation and yoga along with physical exercise can also be advantageous as it helps soothe the mind and body aiding in a good night's sleep. The consumption of alcohol and caffeine may hinder the body's ability to achieve deep sleep. Therefore, it is best to limit its consumption. Quit smoking as well. Take steps to get good quality sleep by maintaining a good sleep rhythm. Get regular medical evaluations done. If your thyroid hormones are well in their limit and if you still feel exhausted, further medical examination can reveal the underlying cause. Indulge yourself in a hobby/activity that you enjoy. It is one of the best ways to de-stress yourself. De-stressing will help release feel-good hormones which help with overall wellbeing as well.